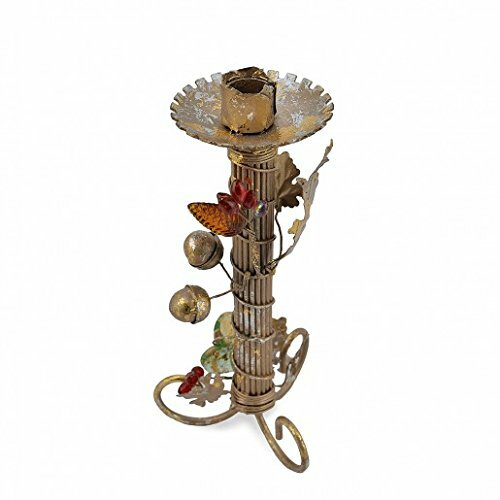 Description : Shaped like twigs graced with glittering golden leaves and berries this exquisite candle stand succeeds in capturing the essence of autumn in its unconventional design. Whether placed on a side table or as a centerpiece, this elegant candle stand shall captivate the attention of every beholder. About Us : VintFlea presents 'The Yellow Door', one of the leading Indian brands for handcrafted home decor and furnishing products. The brand endeavours to promote the Indian handicrafts by integrating their contemporary designs with the unique skills of various craftsmen, and developing beautiful handmade products which can find a special place in your homes. Whether it's finding that perfect piece for your home or looking for a beautiful gift for a friend, you will find it here at 'The Yellow Door' by VintFlea. Care Info : Clean with a soft and dry cloth. If you have any questions about this product by Yellow Door, contact us by completing and submitting the form below. If you are looking for a specif part number, please include it with your message.